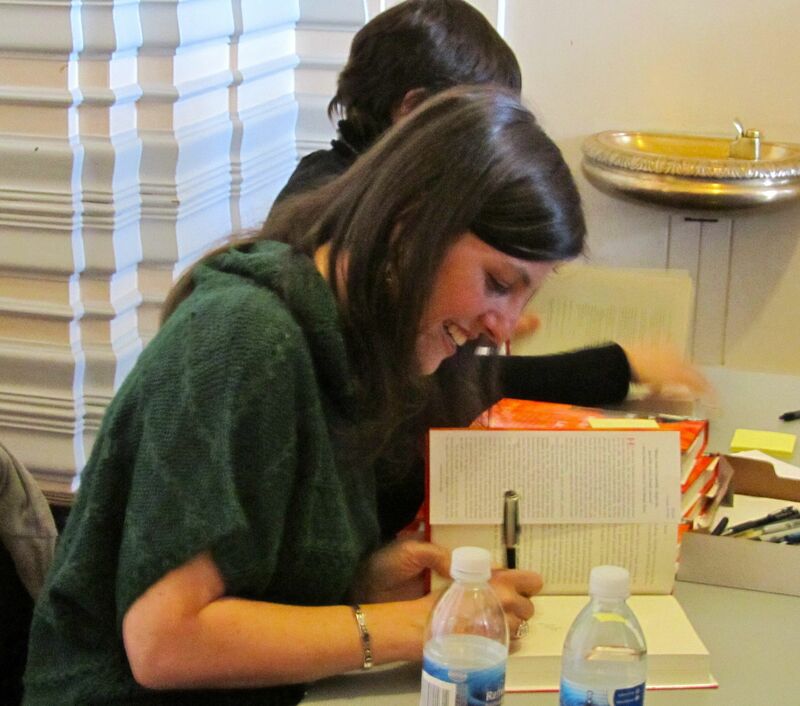 Yes, it was somewhat unreal—but lovely, wouldn’t you say? Shades of grey, white and blue. 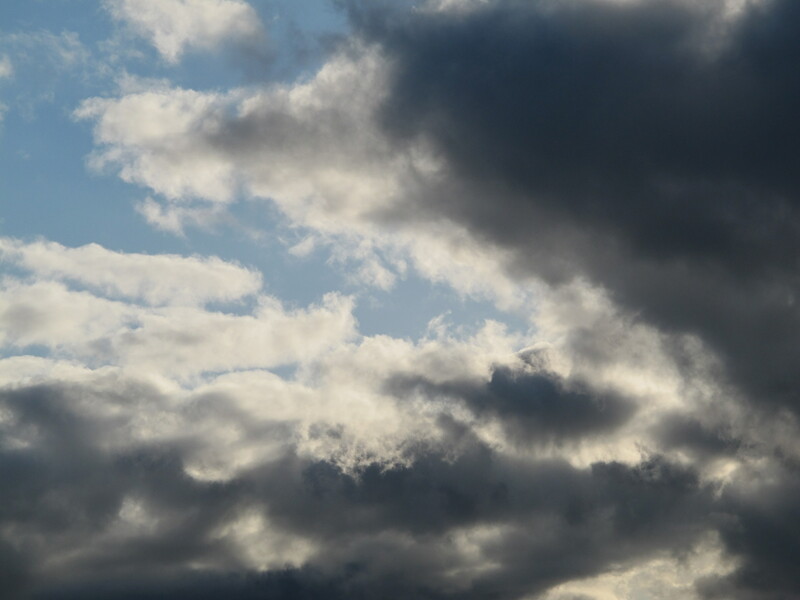 I remember moving from the midwest to Olympia, WA., many years ago and being struck by how the natives counted the grey, rainy days as long as they continued. Then when the sun came out and we had blue skies in spring, they’d say, “well, I know this won’t last long.” I guess I never forget that it could be ice and snow as an alternative. Also, for more than 25 years now I’ve been struck with just how beautiful the grey skies can be—-how many different grey tones there are with their own beauty! This is the fifth Truly Tasha’s Shawl I’ve made, a relaxing, social knit—as well as a wonderful shawl to cuddle up with at home or when traveling. The pattern is available free on Nancy Bush’s website: http://www.woolywest.com (click on “Knitsters’ Notebook.”) I suspect there have been thousands of these made. Over the next week I worked on Tasha in free moments. These moments included times with my Tuesday knitting group which decided to do a shawl knitalong. 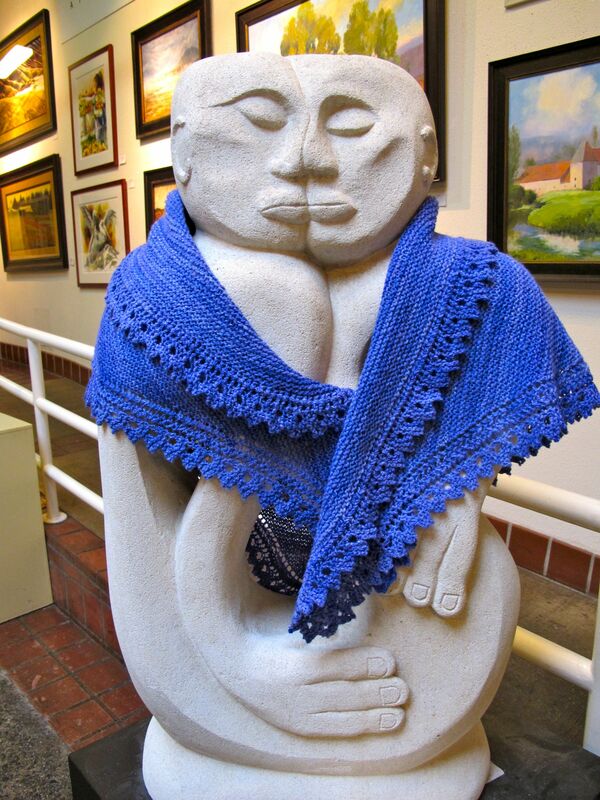 This is different from everyone knitting the same shawl at the same time. 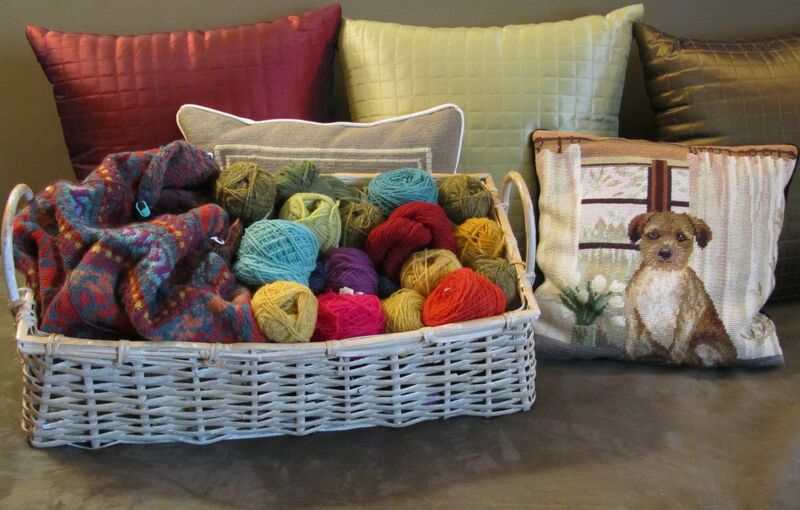 I’ll take pictures to share (and provide yarn and needle information) when the projects are completed. So0n I laid it out on my “Cheap-O” blocking boards (2- 2′ x 4′ pieces of foam insulation purchased for less than $3 each at Home Depot a few years ago): I blocked out the shawl with rustproof t-pins. 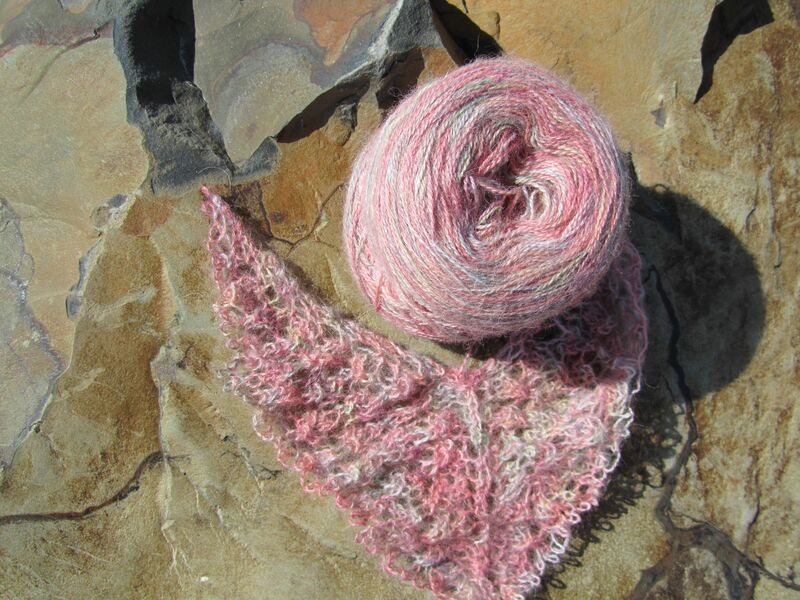 The slightly ruffly top edge rolls over like a shawl collar, making a graceful simple shawl. Thanks again, five-fold, at least, Nancy!! They seemed happy with the finished shawl. This photo was taken in the atrium of the Vancouver Marketplace which features many art work from the Boulevard Art Gallery. The sculpture is made from New Zealand limestone. It’s a lovely piece, appropriate both for indoor and outdoor display. 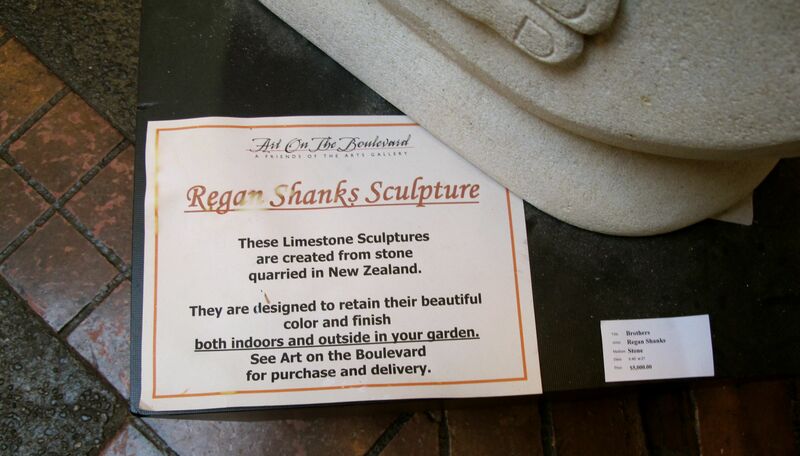 I can testify, however, that NZ limestone is not as smooth as glass, granite or marble. I had to almost peel the shawl off (no damage was done, thankfully), but I would advise anyone thinking about photographing a baby mohair, angora, merino & silk laceweight yarn piece, to think twice before putting it on such a piece!! 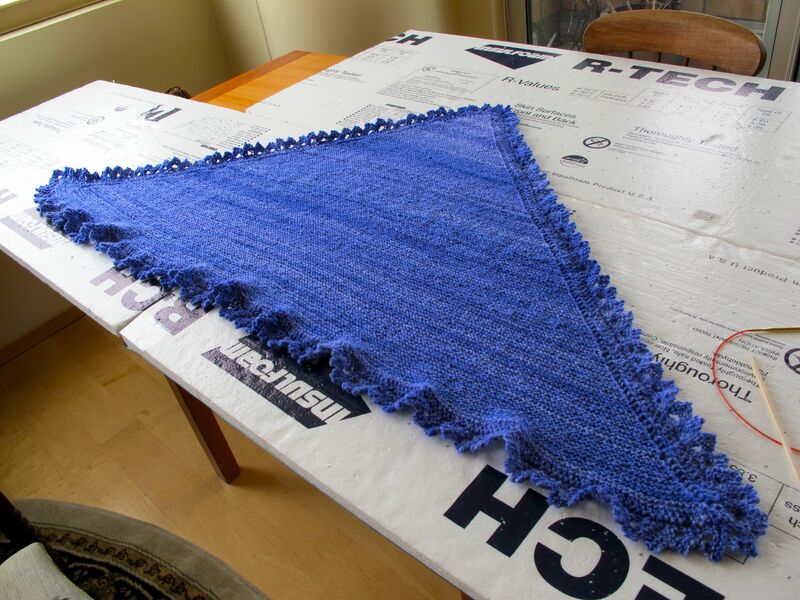 Still, no damage done, and the shawl is lovely in its simplicity. 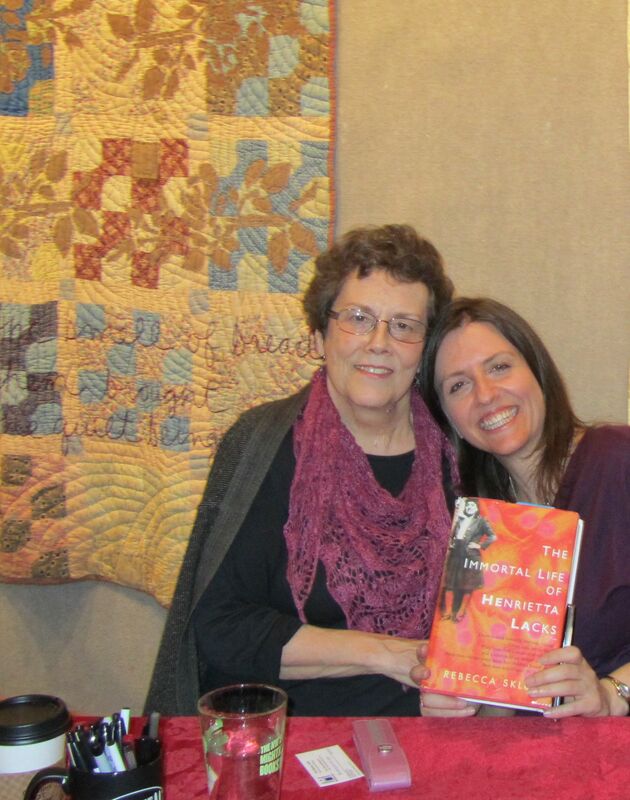 The teal Tasha is with my daughtger on the California/Arizona leg of her book tour. 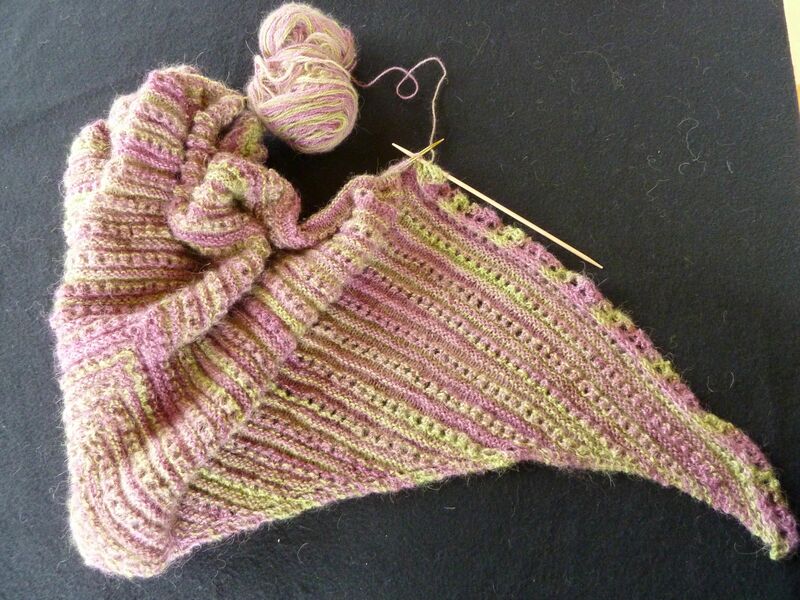 As she left, she admired the new one in “lupin” (one of her favorite colors) when it was still on the needles . I predict that when I next see her, she’ll want to trade the teal for the lupin, and that’ll be fine! I may just get another started with some of my remaining Sandi Spins yarn. After all, if that plastic container is empty (and it’s getting down there! ), I would have an excuse for buying more this fall! In my last blog I didn’t pledge to “finish” every project I’d ever begun. Life is full of choices, and knitting should be, too. Making choices is about deciding what really matters—honing in on the essentials and leaving the rest. When I was an undergraduate English major, I wanted to read every book and learn about everything that remotely interested me. I had an insatiable appetite for learning. 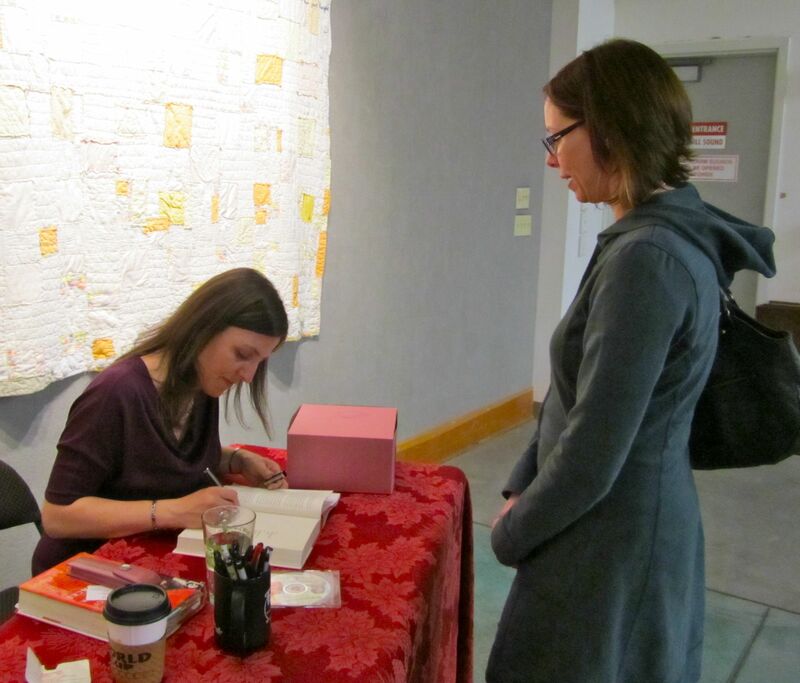 Sometime between then and now, I came to the sobering realization that there would be books I longed to read and experiences I wanted to have that, because of the limitations surrounding any single life, I’d need to forego entirely. It’s about choosing how to spend time. Knitting is no different than reading or any of the other human “wants.” I will admire more yarns and patterns than I can ever knit, and I will imagine more designs than I will ever commit to paper. So, this weekend, while on a wonderful knitting weekend in Manzanita on the Oregon coast, I chose to reduce my UFOs by one. (Note: Never fear. There aren’t many more, so don’t worry that staying with me on this thread will be the knitting equivalent of the camp song, “100 bottles of beer in the wall, 100 bottles of beer, if one of those bottles should happen to fall, 99 bottles of beer in the wall…” Thankfully, I’ve been working on this for a while and don’t have many UFOs squirreled away. Just a couple more! Unraveling the project and carefully winding the lovely yarn back into the ball so that it could be used another day felt good. 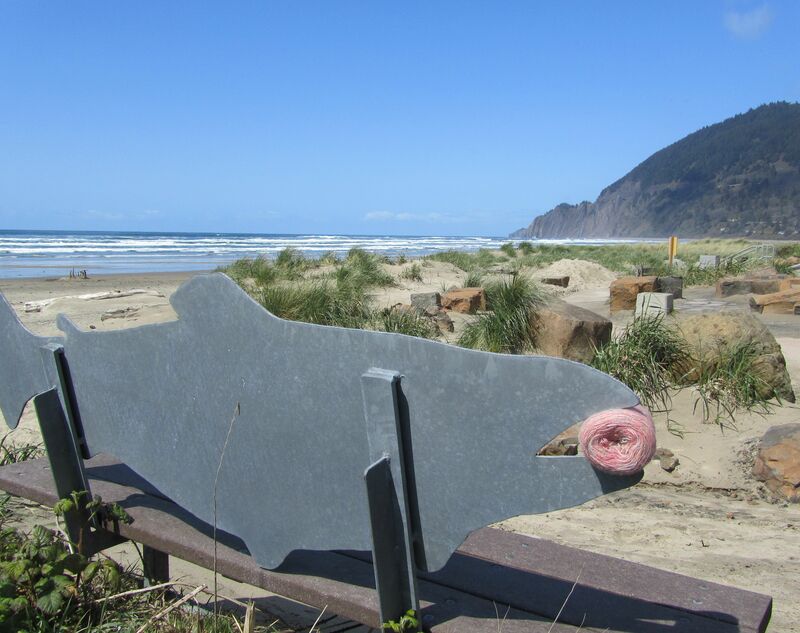 The Oregon coast weather, like that of the rest of the Northwest, doesn’t come with a guarantee. However, this three-day weekend was perfect: sunny, blue skies, happy people walking on the beach with dogs, yarn shops, friends to knit and laugh with, chocolate and good food. 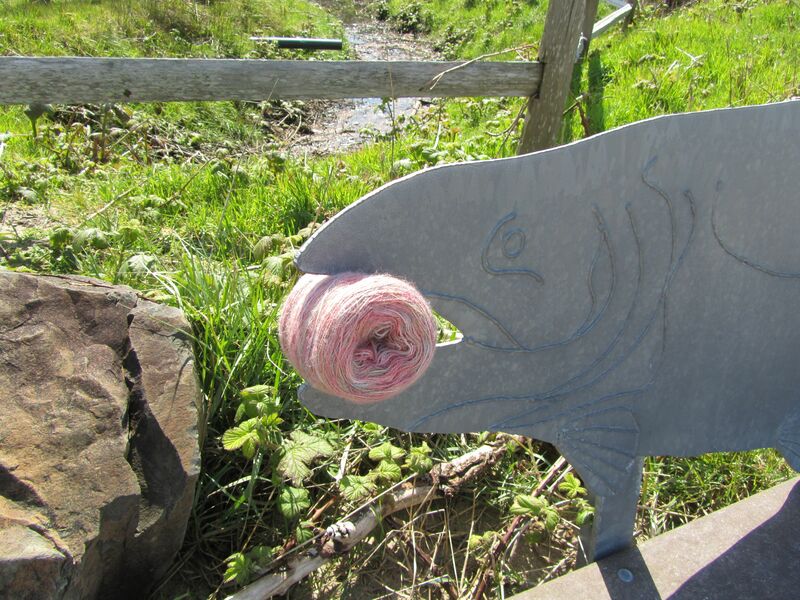 I had fun finding the right place to bid farewell to this UFO: The fish (it’s the back of a bench with a sense of humor) was happy to help out, posing with the rewound yarn held carefully in her mouth. 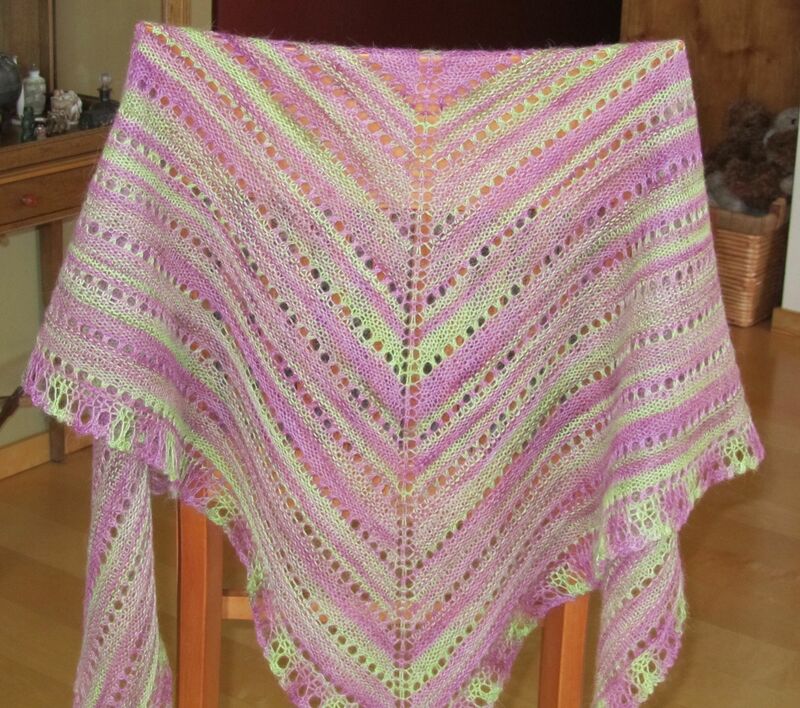 She seemed to smile, reflecting my own feelings at letting this project go and setting the yarn aside for another day — to use or give away to someone to make something beautiful. 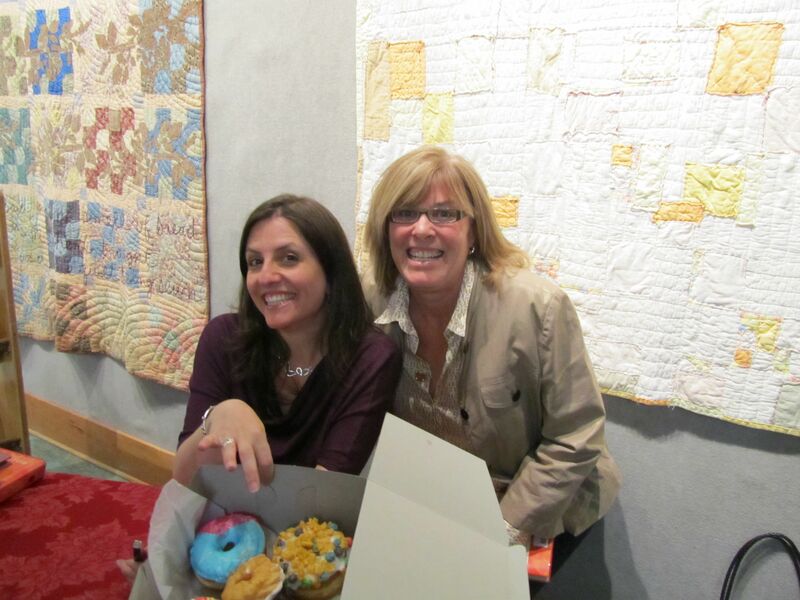 It was a good trade: happy possibilities instead of a project that was weighing me down! As soon as I sent the blog yesterday, pledging to complete two nearly-finished Evelyn Clark patterns, I went into a busy beaver routine. It didn’t take long to finish the “Wildflower Lace Scarf.” I’d run out of yarn only inches from the end and the edging is “do-as-you-go,” rather than applied at the end. So, it wasn’t long before I had that baby finished and blocking. When it was dry enough (although I usually like to leave things blocked out at least overnight), I unpinned it, shook it out and took this photo of it on top of a dark blue t-shirt I had planned to wear during the “Today Show” filming week but didn’t (who knows why?). I like the way the Transitions yarn works in this type of scarf and made it a bit larger than the pattern specified. My blocking system is simple and cheap. I purchased four pieces of foam insulation several years ago at Home Depot (maybe something like $3 each now?) 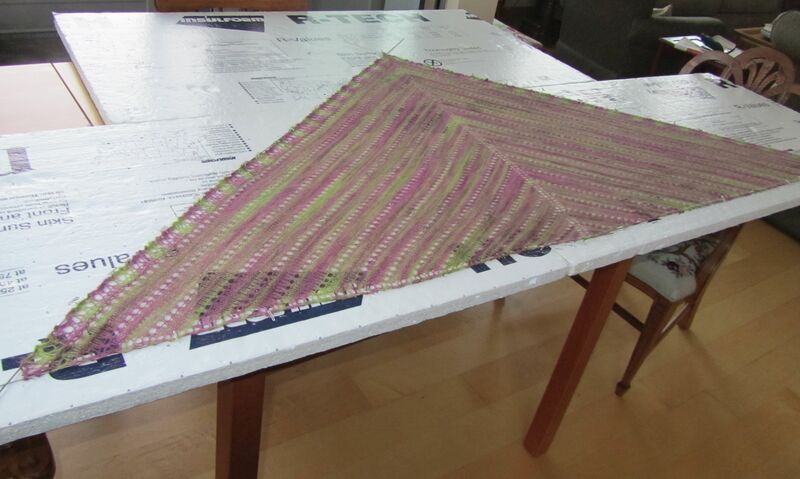 and use three of them to block a large triangle shawl such as “Manzanita.” I use blocking wires, t-pins and a measuring tape—the latter really gets a work-out because I want to be sure that I’m not blocking it into a strange, asymmetrical shape. Since the electronic cottage, aka our condo, isn’t the largest place in the world, we shipped my beloved round oak table with 5 leaves and many chairs (that I had grown up with) to my daughter in Pittsburgh a few years ago. In its place we purchased an inexpensive 36″ x 36″ cherry (veneer) table that has 15″ extensions on each end, making a wonderful 66″ long x 36″ wide blocking surface, I mean dining table. It extends often to be a blocking table and infrequently when we host holiday or other meals with more guests than the two of us plus two dogs. 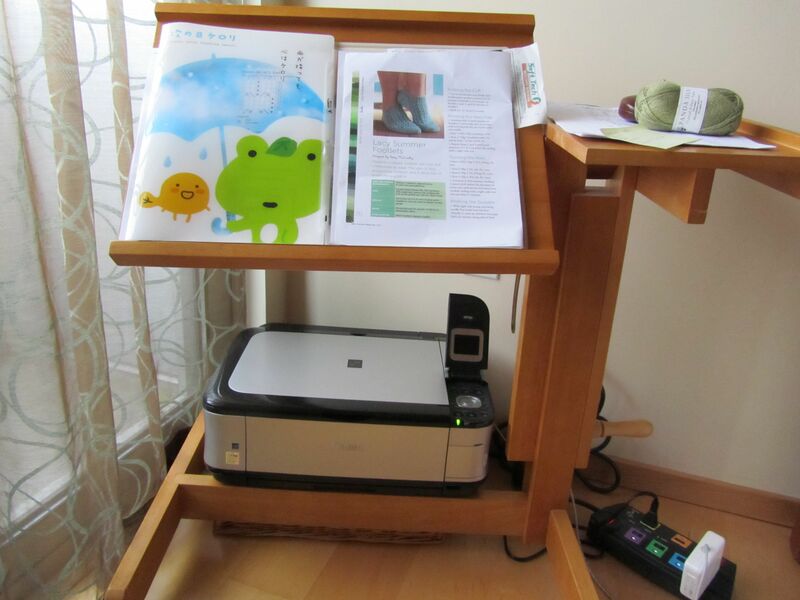 We purchased it at one of those wonderful places—Scan Design, or Dania or Scandia–and it works fine in its multi-purpose role. First thing this morning, after helping my husband shepherd our elderly dogs outside before feeding them–always a good idea, I quickly removed the t-pins and blocking wires, held up the blocked shawl and breathed a sigh of satisfaction. 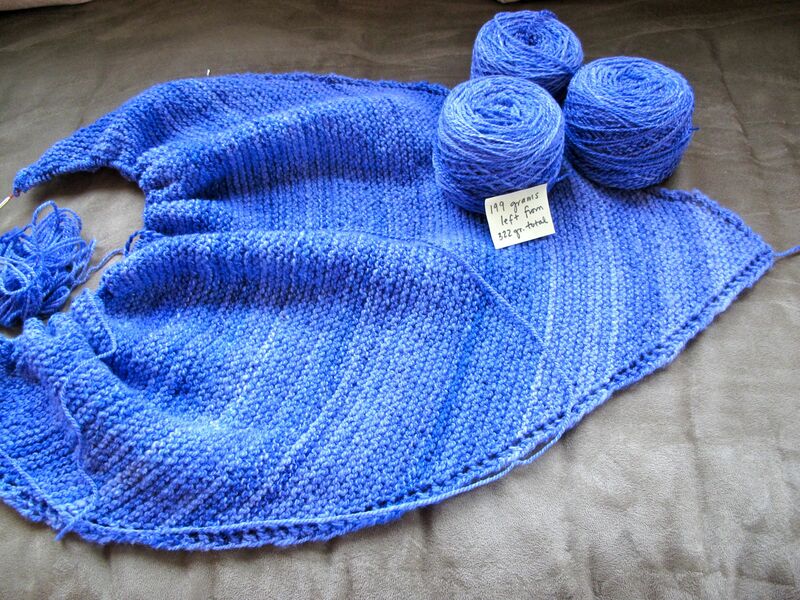 I love the shawl, although I’ll probably do with it what I do with 95% of what I knit—give it away to a special person. This afternoon I met friends at a bagel place that generously allows knitters to use a very large, unoccupied space behind a door you have to get very detailed directions to find. The first time I went there, I missed it altogether. 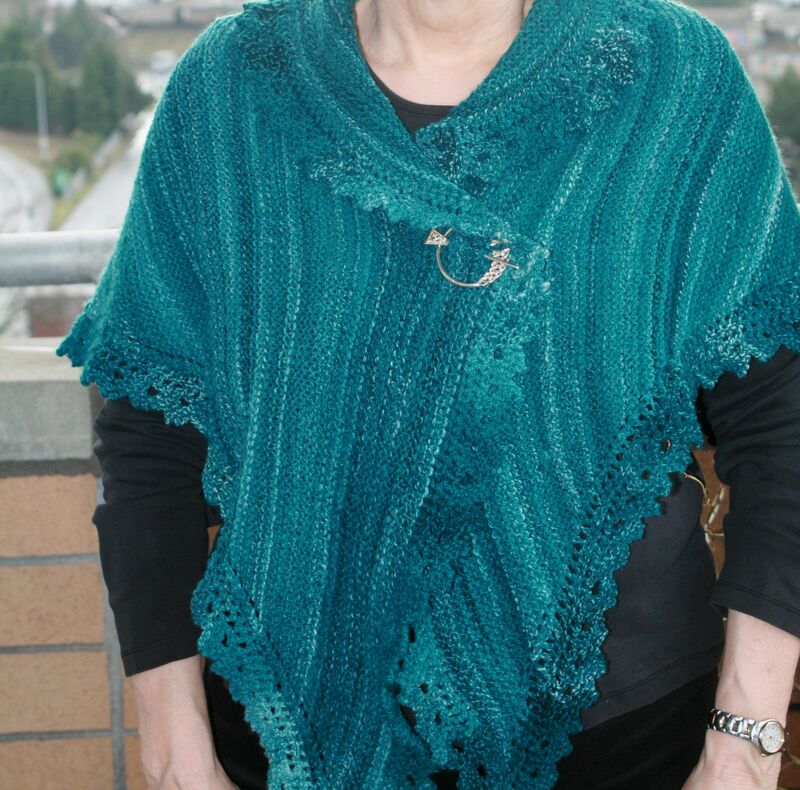 Linda, a knitting buddy, modeled “Manzanita” for all of you to see on a real person: I don’t get a kick-back from Evelyn Clark on this pattern (although maybe I should…), but tell my knitting students/ buddies that it’s a great place to begin knitting lace. Once you get into the swing of the pattern, it becomes clear how most of the pattern rows are either knit or purl rows and occasionally (maybe every 11 rows?) there’s a yarn over, K2tog row–easy to remember with minimal notes. Yes, this was a very splendid (and cleansing) thing. 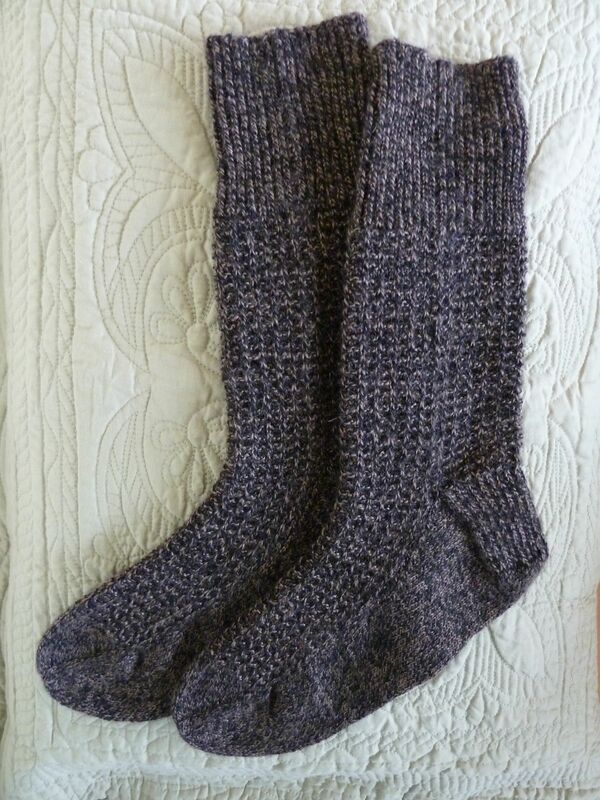 And now I move onto another of few remaining UFOs: some basic leg warmers requested by my niece Darla in Illinois. 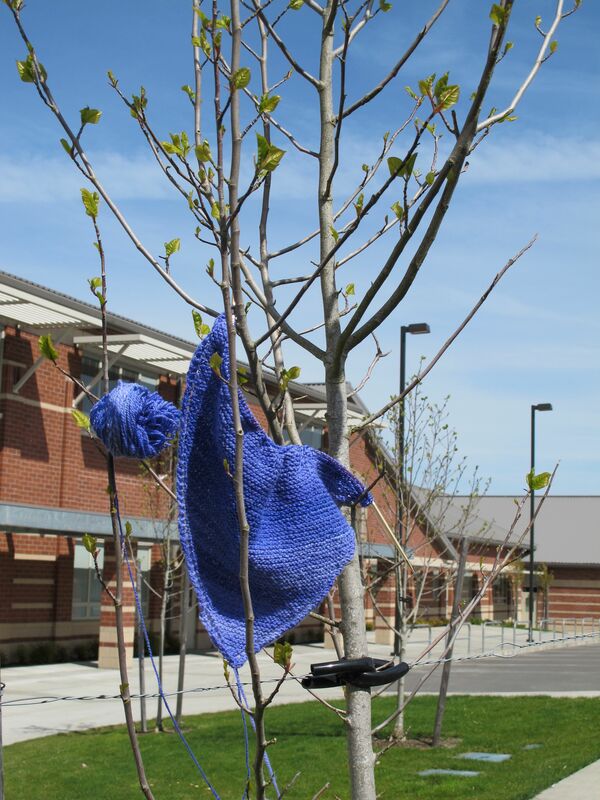 I leave tomorrow for a weekend knitting retreat with my local guild–the Fort Vancouver Knitting Guild. The legwarmers will be perfect to work on while we visit! I’m not promising I’ll have a picture of them posted by Saturday night because I don’t know whether I’ll have a good internet connection or not. I’ll face the remaining UFOs when I return. After all, one of them has been aging for a little more than 10 years and another for something like 8 years–what’s the rush? Maybe as I’m hiking this weekend inspiration will come to me about how to deal with those two very old UFOs! I’ll show them to you when I get back. It’ll be such a relief to finally come clean about them. Meltdown in the electronic cottage. Yes, there’s been a lot of that happening here in our condo after 5+ years. Things have been going belly-up with mystifying regularity. 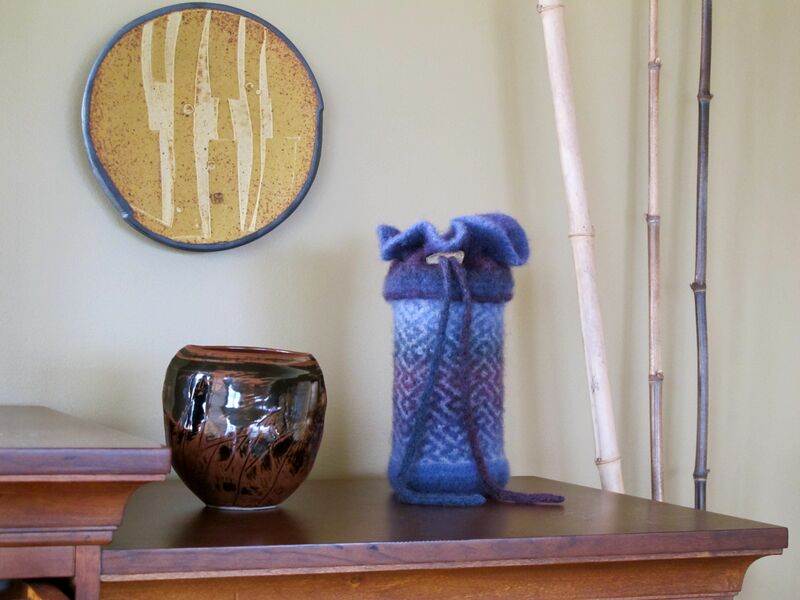 Remembering words from a Robert Frost poem, “the best way out is always through,” I’ve been working through this, eager to finish so I can get back to my knitting and projects that are calling loudly to be completed. First to go was the heat pump fan installed in the ceiling. Things are often not as simple as they first appear. When it was all over, the final bill included a new fan and the cost of cutting away and replacing a portion of the ceiling (because the pump had initially been installed incorrectly). Could there actually be a law in nature that prevents costly items from breaking down during warranty periods? 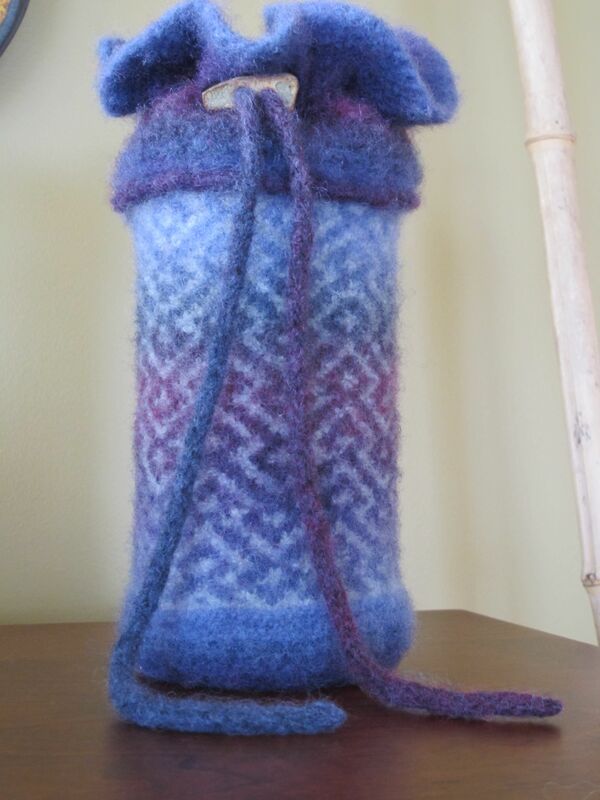 To celebrate getting back to my real life, my knitting life (or maybe as a cleansing ritual? ), I am dealing with my UFOs. Thankfully, my unfinished projects are few in number. You may have noticed that I didn’t say I’d finish them—-just deal with them. It’s a clean slate I’m after! Or maybe this is my version of spring cleaning. Yesterday I finished my son’s late Christmas socks. He likes 4″ ribbing and long legs . 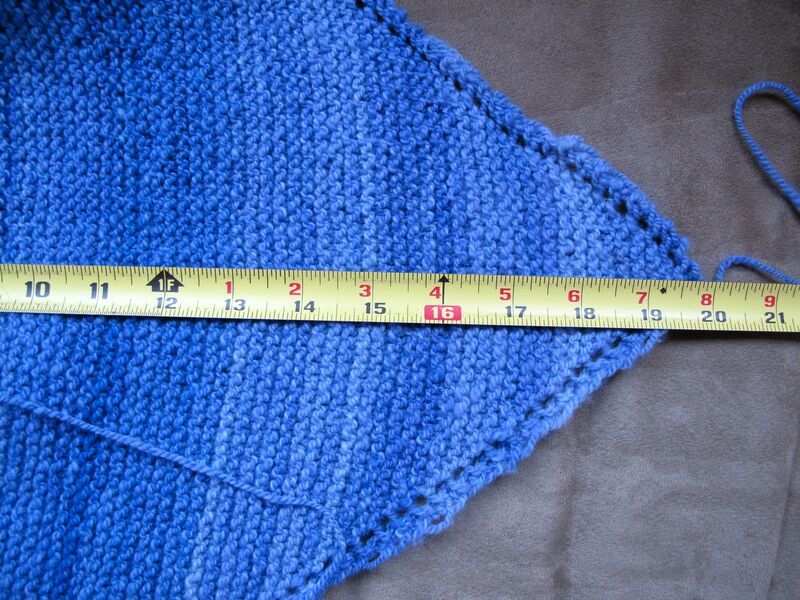 These measure 10 inches from cast-on to the beginning of the heel flap. A lacy-topped version of this pattern (“Rhythm”) appears in the new edition of my book “Knit Socks!” which will be available from Storey Press in September. Next to be completed are two very close-to-being-finished lace projects. 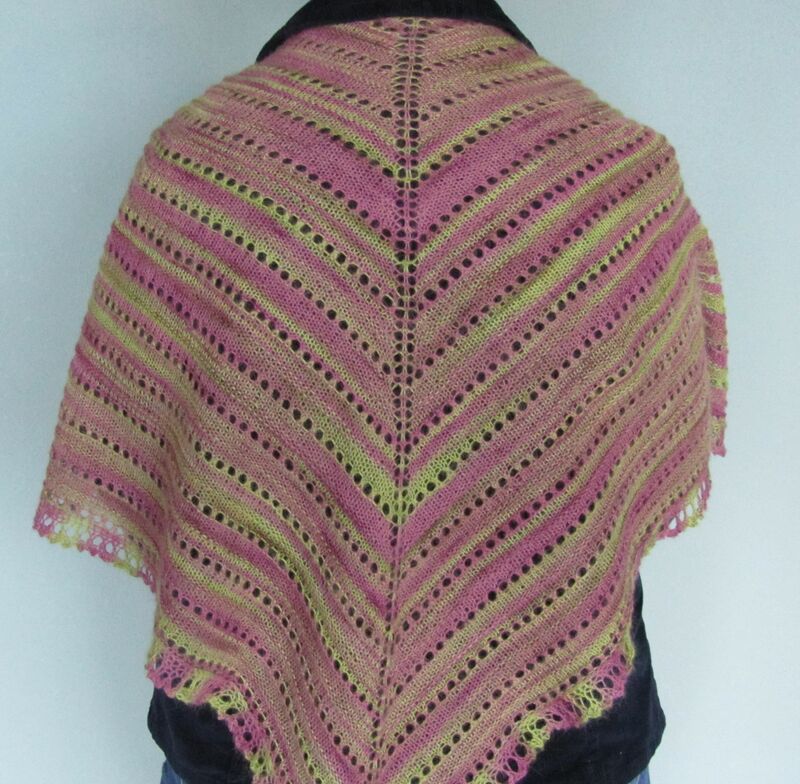 The first is “Manzanita,” a triangle shawl pattern by Evelyn Clark. 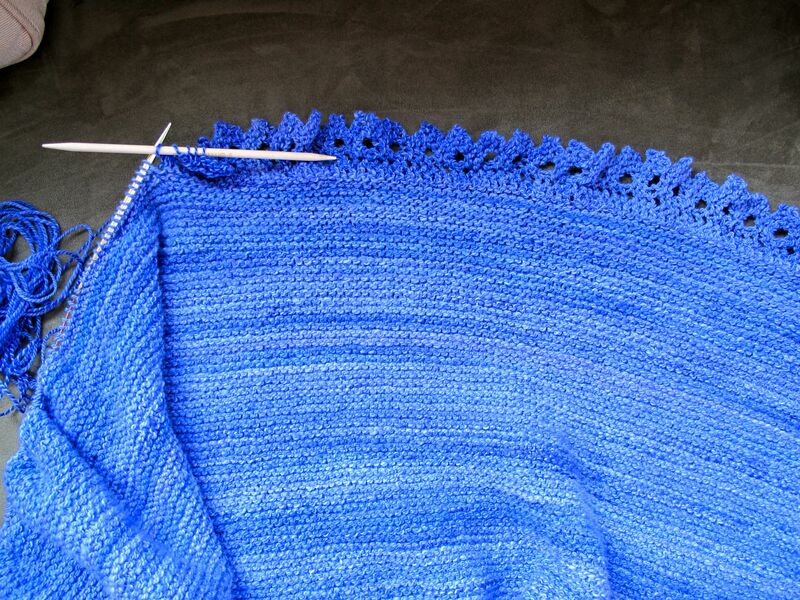 I had just started applying the lace edging when I put this down in July. 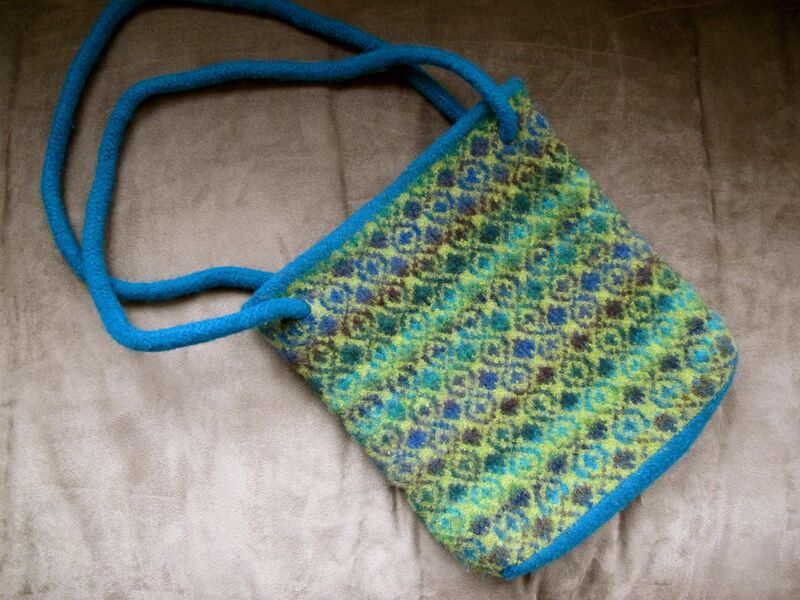 This is the third time I’ve made this pattern from Fleece Artist Suri Blue yarn. The pattern is easy enough for relaxing social knitting. Note: the color is more yellow-green than the yellow that shows up here on my monitor. 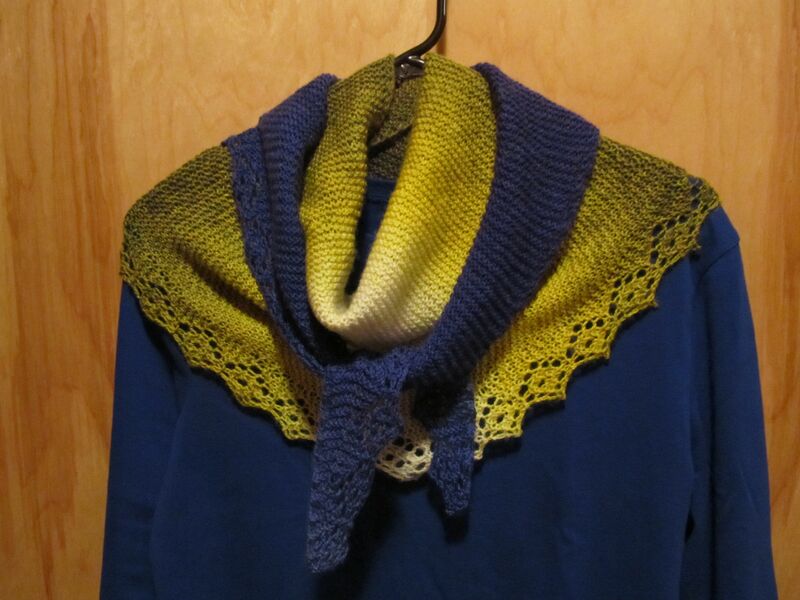 The second is “Wildflower Lace Scarf,” also by Evelyn Clark and knit from Gypsy Girl Creations “Transitions,” yarn in “viola bouquet” color. 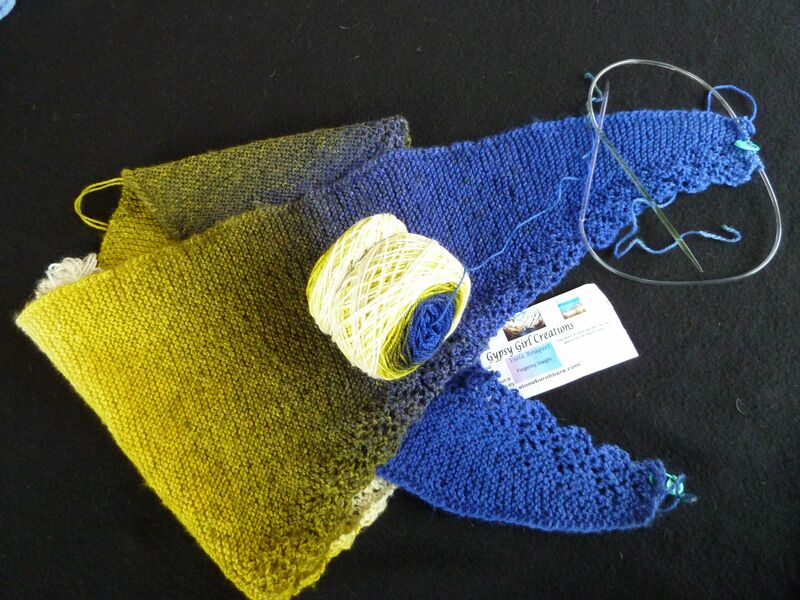 The hand-dyed colors move from an intense sapphire blue at one end of the skein morphing into a brassy gold and then to a buttery natural at the other end. It’d be fun to use both ends of a 50 gram skein to make slip stitch patterned gloves or socks. I was on a roll knitting this side-to-side garter stitch scarf over the course of a few days in early March when I confirmed (a few inches from the end) that I needed to order more yarn to finish it. If I keep on track, I should be able to finish both projects tonight or tomorrow. It’s good to be back tending to my knitting!